You are very hyper. You never slow down, even when it's killing you. You're the type of person who can be a workaholic during the day... and still have the energy to party all night. Your energy is definitely a magnet for those around you. People are addicted to your vibe. Hello everyone, I hope you are having a great Sunday!!! 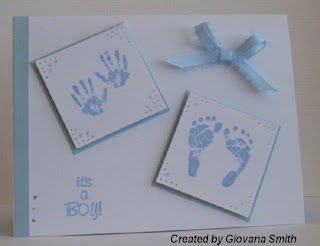 I just want to show the baby cards I made for my Stamping Party, it was a party just for fun!! Three wonderful ladies from church came to my house and we stamped together and I also showed them a couple of techniques. Cardstock: White, Barely Banana, Light blue, Pretty in Pink. 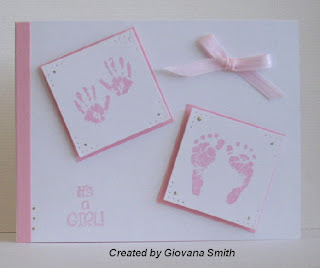 Stamps: Baby hands and feet by StampCraft, Studio G Clear Stamps for sentiments. Ink: Pretty in pink, Bashful Blue, Marigold Morning. Embellishments: Satin yellow, pink and light blue ribbon. Accessories: Plastic canvas for paper piercing, Dimensionals, gold stickles, Mini glue dots. Blog candy is now closed. Winner has been chosen, THANKS!! I really want to say THANKS!!! to all of you. You have been amazing with me and I want to celebrate that with you with a BLOG CANDY!!!!. I just noticed that I passed the 10,000 hits!!!! and also I have great news to share with you. So what do you have to do??? Just leave a comment here. Do you want to double your chances to win?? Post a link about my blog candy on your blog, come back and let me know and I will write your name twice. I will choose the winner on October 5th. Good luck everyone!!!! 4 pieces of 6"x6" Cerise DP. 4 pieces of 6"x6" Outlaw DP. 4 pieces of 6"x6" Cutie Pie DP. 2 pieces of 4 1/4 x 5.5" each : Glorious Green, YoyoYellow, Tempting Turquose. 1 set of Studio G Clear Stamps. I will add more stuff tomorrow !!! Thanks of much for being so supportive and kind with me. Hi again everyone, just something funny to share with you. I was checking the Verve Forum today and I was curious about the cards for the Meet the Verve Divas Challenge, so I went there and I was looking for my card, never found it, I got upset, I checked again, I was pretty sure I posted my card and it had to be somewhere. Finally I gave up, I checked my stack of cards and guess what....I didn't make a card for this challenge, LOL. 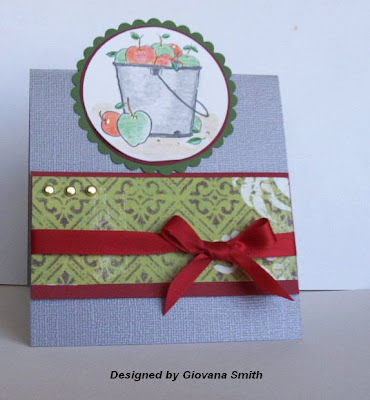 I made 2 cards and a card holder for the Gettin' KRAFTy challenge but not for the Verve Diva Challenge. I couldn't stop laughing, silly me, so when my DD is napping I finished a card for Laura's Verve Diva Challenge. Ohhh I feel much better now, LOL. 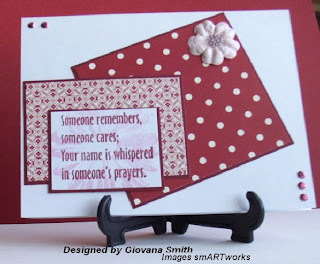 This challenge is to create a card using TAGS, oh well, tags sound too much for me because I don't use tags in my cards, so I used only 1, I found this one in my drawer next to other pieces of paper, it says SWEET, so it is perfect for my card. Card Stock: White, Pink Pirouette, Blush Blossom. 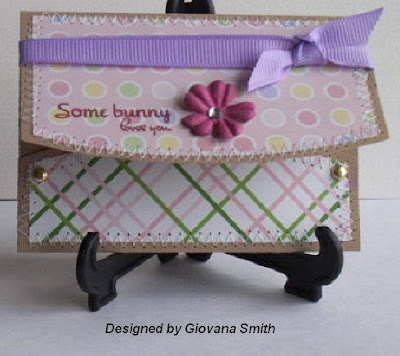 Stamps: Some bunny by Verve. Embellishments: 5/8" Striped Kiwi Kiss Grosgrain Ribbon, Offray Yellow and Pink satin ribbon., tag, gold brads, Gold stickles. Accessories: Sewing machine, white thread, Dimensionals. Happy Wednesday everybody. Today is Sketch Challenge Day on SCS and I had some time to play. I really missed paying challenges, I used to do it everyday, but lately I don't have much time to play, anyway, I combined this challenge with 2 other challenges one is from Ashley's Brainwave Challenge using Riding Hood Red, Kiwi Kiss, Kraft and Chocolate Chip, the other challenge is from the Wish Rak Group Card Contest Category #2 :Christmas card. 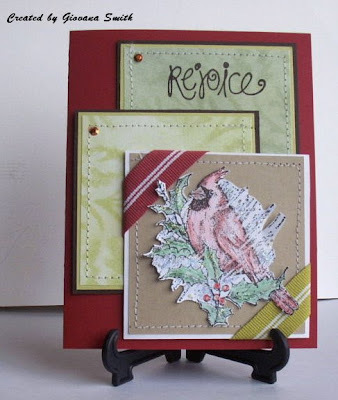 The image is from SU "A Christmas Cardinal" I got it last week during the "Share-athon" of Christmas images at my demos stamping party. I got really pretty images I don't own, super cool. Card stock: White, Kraft, Real Red, Chocolate Chip. Kiwi Kiss. Embellishments: Riding Hood Red and Kiwi Kiss Ribbon, mini rhinestones. Accessories: Sewing machine, white thread, Dimensionals, Waterfall Stickles, Liquid Applique, watercolor pencils. Hello everyone, today I am posting about our next Tea Party Challenge. This is going to be due on October 1. 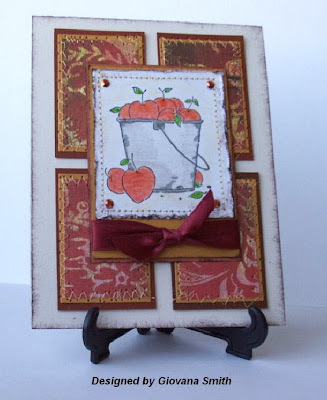 This time Peggy is hosting the challenge and she is giving a Sketch and Paper Pieced Challenge. 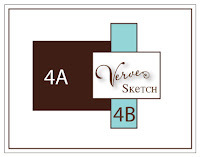 If you would like to play with us, please make a card using the sketch and post your card here so everyone can see it. Happy Tuesday everyone. I hope you are having a great day. Do you still do yard work? Well, our yard is full with huge weeds, DH has been working on that and today I was tired to see them flying that I decided to move them into a big pile. I didn't think I could end feeling so tired. My whole body hurts, especially mu knees. DD brought me a bottle of water and sat down on the stairs when I was taking a break. She always helps me that way, but never pulling weeds or doing the hard work. She says she is a Princess and princesses don't do that :S.
Oh well, today I have time to play Heather Scott's Sketch. Her sketches are so pretty and easy. 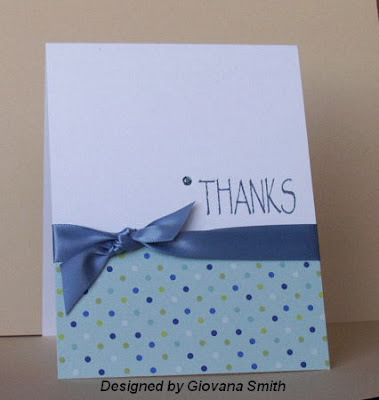 My card is very simple, for the image I colored it first, then cut it out and glued it onto my CS. Then added some Waterfall Stickles. Card stock: White (GP), Bashful Blue, Bazzill Blue. 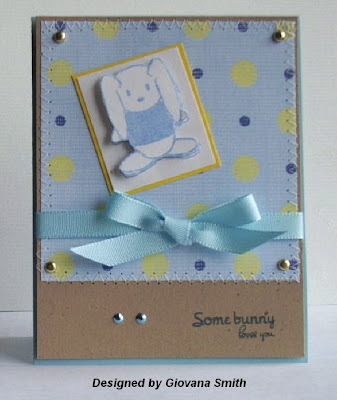 Paper: SU Simply Scrapping "Out & About"
Embellishments: Bashful Blue ribbon, Mini rhinestones. Accessories: Glue, Diamond Glaze, Waterfall Stickles. 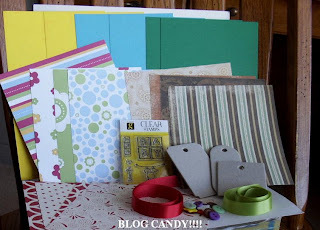 Have you visited Cammie's blog and check the great blog candy she is offering??? More the 1,000 dollars in prizes, awesome !!! !, but why? you may ask, well, her grandmother passed away last June from consequences of Alzheimer disease and yesterday in celebration of the World's Alzheimer Day, Cammie is asking to make a card for all the caregivers who take care of the people affected with this disease. When I read that, I was in tears, my Father-in-law is suffering from this disease, hard to believe 6 years ago when I met him, he was working, driving, being so active, and now he is in a Nursing home, hardly talks, moves or does anything by himself. This disease is really aggressive, and he is going down very fast. Yesterday I called my Mother-in-law and told her that it was the World's Alzheimer Day. I asked her the name o f the Nursing home and it is "Riverside" located in Centralia, WA. (This is a picture of him and DD and DH last Christmas when we visited him)I told her I will make some cards so she could give them to the people are taking care of him, she agreed and was very thankful. Please, if you know anybody suffering from this disease, send a card to the caregiver, or maybe you don't know anybody, but you know a Nursing home taking care of the people affected , just go there and leave a card for the staff, I bet they will appreciate it very much. Embellishments: Offray Satin ribbon (Antique Blue), Mini rhinestone. 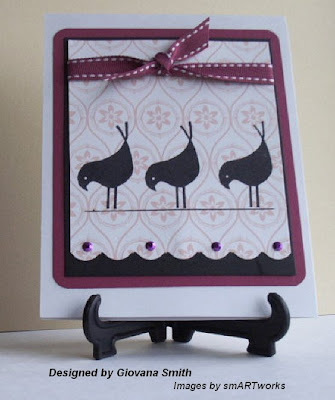 As a Guest Designer for smARTworks I have received some set to work with, one of my favorites is Birdie Fun , these birds are so cute and you have endless possibilities of creations. This time I used a couple of them and I create these cute cards. 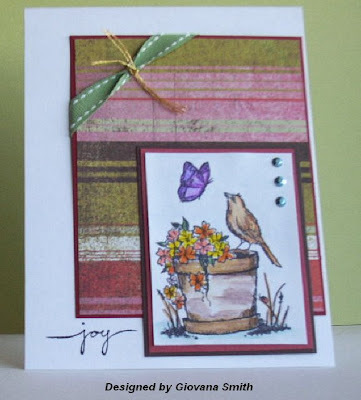 For this card I used the Sketch from Mothers and Daughters Creations Blog. Car stock: Sage Shadow, Handsome Hunter, White. Stamps: Birdie Fun by smARTworks. Embellishments: Prima flowers, Gold brad, Mini rhinestones. Accessories: Sewing machine, White thread, Dimensionals, Diamond Glaze. 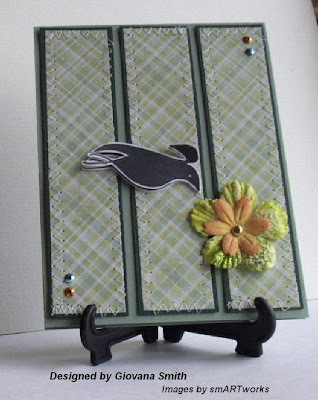 This second "birdie card" is so much fun, the story of this card started the other day when I was making a card, I saw through the window and I saw a lot of black birds standing on the power line, since then i had the idea to create something like this. 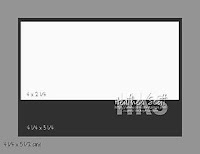 Card stock: White, Purely Pomegranate, Basic Black. Embellishments: Purely Pomegranate Double stitched ribbon, Mini rhinestones. Accessories: Corner Rounder Punch, Diamond Glaze. For my last card I used another favorite set Daisy Trio #2. 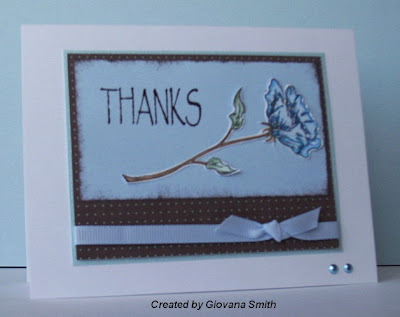 I tried Dina's reverse 3 step stamping and I used Heather Scott's Sketch . 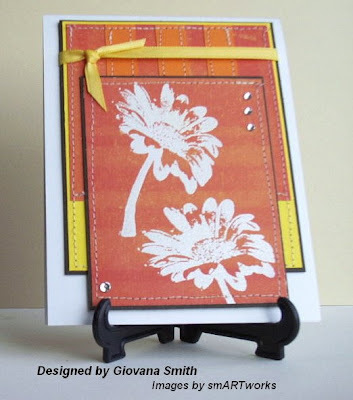 Stamps: Daisy Trio #2 by smARTworks. Ink: Bashful Blue, Stazon Back. Embellishments: Gold brads, American Crafts Light blue ribbon. Accessories: Sewing machine, white thread, Mini glue dots, Dimensionals. Have a great and blessed weekend. Happy Saturday everyone, I am so sorry for being a bad blogger. I have been busy (as always) and didn't have much time to post even though I have created some cards. 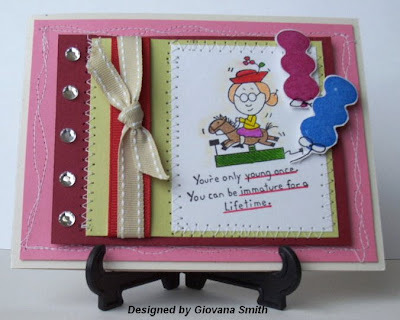 Anyway, I want to show the cards and card holder I created for September Project Parade at Verve's blog. This time Being KRAFTy. To be honest, Kraft is a color I hardly use, but I would say that know I have tried it I love it!! 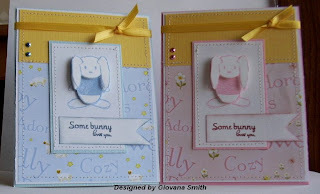 I used my "Some Bunny" stamps (I hope you are not tired of seing this cute bunny again) and made 2 baby cards and a baby card holder. Card stock: Pretty in Pink, White, Kraft. Paper: DP My Mind's Eye..
Embellishments: Offray Pink Ribbon, Buttons. Accessories: Sewing machine, white thread, Mini glue dots, Dimensionals, White ep. Embossing heat gun. Card stock: Light blue. White, Yo-Yo Yellow, Kraft. 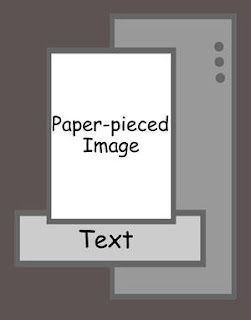 Paper: DP My Mind's Eye. Ink: Bashful Blue, Buckaroo Blue. Embellishments: American Craft Light blue ribbon, Gold brads, Blue mini rhinestones. Accessories: Sewing machine, white thread, Dimensionals, mini glue dot. Embellishments: Offray Purple ribbon, Gold brads, Prima flower, Mini rhinestone. Accessories: Sewing machine, white thread. This afternoon I had some quiet time while my daughter was taking a nap and I made a "Blinded card" first time I do something like this. 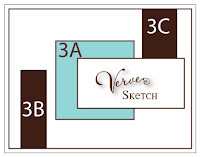 Verve Forum on SCS (Meet the Verve Divas) has a new challenge: blinded pick 3 papers and make a card with those ones. I always have problems creating a card just looking at my papers, imagine me doing this blinded, LOL. Anyway, I came up with the idea of a Baby Quilt, so I could arrange the papers giving them a better look. 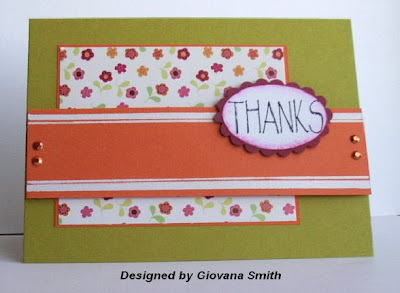 For my card, I cut each square 1.25", after taping them on my Certainly Celery CS, I started sewing using white thread. For the image, I stamped Some Bunny twice, I cut out the second image and added onto the first one using 3D foam. After that I chose some mini buttons and added some white thread, glue them with Mini glue dots, some Purple ribbon and VOILA!!! It took me 1 hour to finish my card, but I love it. Card Stock: Barely banana, Certainly Celery. Paper: Miss Elizabeth, Gold from Costco. 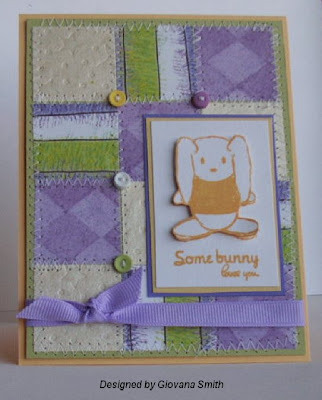 Stamps: Some bunny from Verve Visuals. Accessories: Sewing machine, white thread, needle, Mini glue dots, 3D-foam. Hello everyone, I hope you are having a great day!!! Today is Tea Party Day!! First I have to apologize because this post should have been here a lot earlier, I set this up, but I supossed I did something wrong. Anyway, last week I showed you the piece of artwork I found at Target.com as my "Inspiration Piece". This piece is so bright and cheerful, making anyone happy. 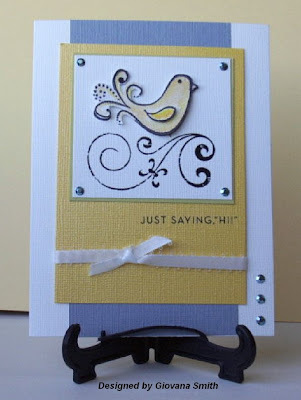 For my card, I used my Daisy Trio #2 , I used only the second stamp and embossed it using White embossing powder. I stamped the image onto Designer Paper, I really love this shades of orange in it. 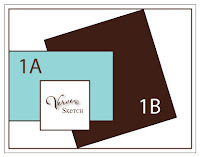 The second and back part is a combination of Designer Paer, Only Orange and Yo Yo Yellow Card stock, both have as a base Chocolate Chip Card stock. 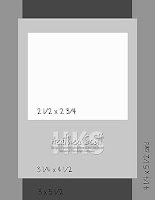 The card base is white and is 4.25" x 5.1/2". I used my sewing machine using white thread, gives it a really nice look. 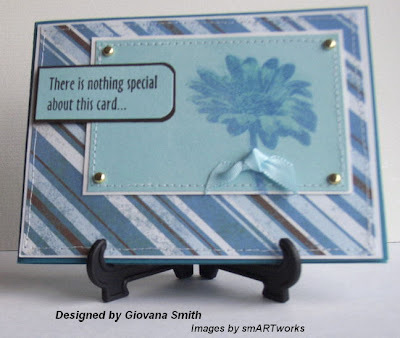 If you would like to play the challenge with us, please make a card using the "Inspiration piece and then post your card here or any of the smARTworks team. Card Stock: Chocolate Chip, Only Orange, YoYo Yellow, White. 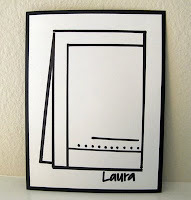 Paper: Around the block Designs. Embellishments: Yellow Satin ribbon, Clear rhinestones. Accessories: White ep, Embossing gun, Sewing machine, white thread, Dimesnionals. Check out Dina, Susan and Trish's awesome creations. Hi everyone, I have more cards to show you. Yesterday, I received my "Some bunny" stamps from Verve Visual. I won this set last week during the release party on SCS and today I finally could ink my new bunny stamps. Let me tell ya, this bunny is adorable!!! I made 4 baby cards, 2 pink and 2 blue. I will have a stamping party next week at my house, so these 4 cards are going to be a "Prize" for one of my lucky friends. The sketch I used for my card is from "Our Creative Corner"
Card stock: Pretty in Pink, Textured Baby Blue(Bazzill), Textured Yellow, White. 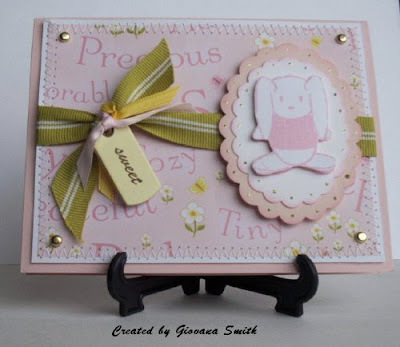 Paper: Welcome baby-Pastels American Traitional Designs. 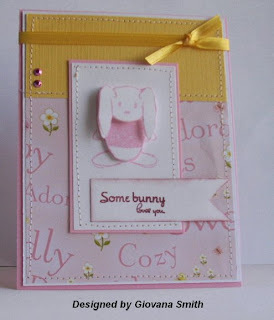 Stamps: Some bunny by Verve Visuals. Ink: Pretty in Pink, Bashful Blue, Cranberry Crisp, Buckaroo Blue. Embellishments: Mini rhinestones, Yellow Satin Ribbon. Accessories: Dimensionals, Sewing machine, White thread, Mini glue dots. Happy Tuesday everyone. I hope you are having a great day. Here in the NW the weather is crazy, as always, hot during the day and cold during the night. 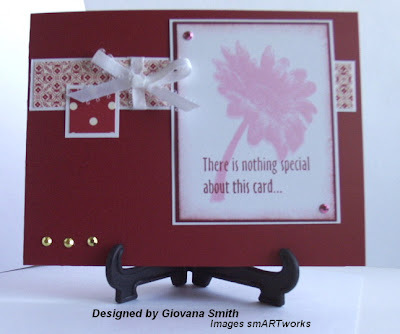 I have a card to show you today, I played the Color Combination Challenge on SCS . Today's colors are: Riding hood red (or real red), Basic gray and Always artichoke. My card base is 9" x 4.25" folded in half. The red part is 4.25" x 2" and the DP is 4.25" x 1.5". The images was stamped in white CS. I used my Coluzzle for the circles and I used my scallop scissors for the Always Artichoke CS. I added 3 gold brads and Red Satin Ribbon. I colored the images with Watercolor Pencils and Colored Pencils. I think IRL this card looks much better. 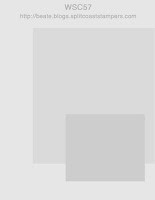 Card stock: Real red, Bazzill Gray, Always Artichoke, White. Accessories: Watercolor pencils, Colored pencils, Coluzzle, scallop scissors, Dimensionals, Gold Stickles. Embellishments: Gold brads, Red Satin Ribbon. This is the second card I made today, this time is for 2Sketches 4 You . Laura created a precious sketch and I really wanted to try something with a lot of layers and I did!!! My card has 9 layers!!!! I really really like this card and I hope you too. The flower has Dimensionals for a 3D effect. Card Stock: White, River Rock, Pale Plum. 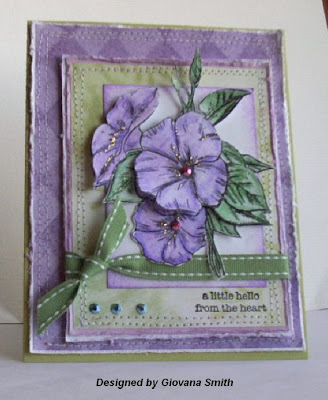 Paper: Lilac by Miss Elizabeth, Green by K&C Company. Embellishments: Double stitch ribbon, Mini rhinestones, Gold stickles. Accessories: Sewing machine, White thread, Dimensionals, Diamond Glaze, sponges, pointy scissors, Watercolor pencils. Happy Saturday everyone!!! Today I had time to sit down and stamp without interruptions, great time!!! I tried Beate's Sketch Challenge. I changed colors at the last minute, I was using kind of pink for the base card, but I didn't like how this looked, so I decided to go just with white. Card stock: White, Real Red, Ruby Red, Chocolate Chip. Stamps: Small Scripts, Serene Spring. Embellishments: Double Stitch ribbon, Gold thread, mini rhinestones. 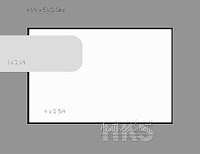 Card stock: Naturals White, Really Rust, More Mustard, White. Ink: Stazon Black, Watercolor pencils, Markers. Embellishemnts: Mini rhinestones, Satin ribbon. Accessories: Sponges, Diamond Glaze, Sewing machine, yellow thread. With this card I tried to use the Orange District ribbon, but it looked too thick, so I decided to fake it a little bit ;) I used my Only Orange CS and white ep, my ruler and VOILA!!! I got almost the same effect than the ribbon and it looks perfect. Card stock: Kiwi Kiss, Only Orange, Burgundy, White. Stamp: Sea Life by H&MStamps. Accesories: Dimensionals, Diamond Glaze, Ruler, Embossing gun. Hello everyone, I hope you are having a great Wednesday. Are you ready for a next Tea Party Challenge??? GREATT!!!! I am hosting this challenge and I hope you play along with me. 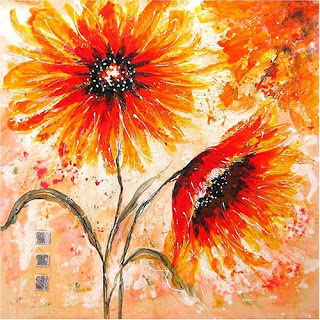 This time is an Inspiration Challenge, while I was searching "Target" I found this really pretty piece of art, so I thought this could be great for our challenge. Get inspired by the color, shape, or anything you see in it, then post your creation here so everybody will enjoy it. I will post my creation next Wednesday with the rest of the Design Team members. Hi again, this is my second late post. Have you heard about OSW before???? Well, if yes, awesome, if not you are just like me, LOL, when I stopped yesterday on the Verve Forum at SCS and read OSW I was lost, now I know :) This is my first time creating under OSW and I love it. 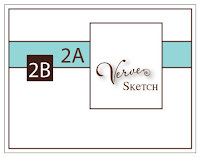 Verve Forum September release is tomorrow and Julee did it again!!! new and awesome challenges. I went Red and White with my cards, maybe because I am Peruvian and my flag is Red and White, I love how my cards turned out and I hope you too. Just in case you don't know about the challenge, just stop here and you will find all the info. My DP I used is from SU Cerise, retired now, but simply beautiful. To be honest I loved one side, but not the other, so I decided to use another different sheet from the same designed. Ink: Pretty in Pink, Cranberry Crisp. Embellishments: Prima flowers, Mini rhinestones. Card stock: Real Red, White, Burgundy. Embellishments: Mini rhinestones, White ribbon. Ink: Cranberry Crisp, Watercolor pencils, White embossing powder. Embellishments: Mini rhinestones, White ribbon, gold brads. ETA: All card recipes added. Happy Monday everyone, I hope you all had a great weekend!!!! Yesterday I had the chance to make a card, but it was to late when I wanted to take a picture. Anyway, This time I tried Heather Rolin's Challenge . Every Saturday she posts a double challenge for you: Sketch and Color Combination Challenge. I made it 2 in 1. I love the colors she chose for this week and the Sketch is really pretty too. I twisted a little bit, my image is a little bit big, but I will try it again with a smaller image. 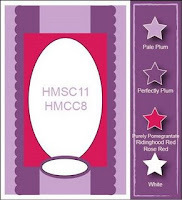 Card stock: Pale Plum, Perfect Plum, Purely Pomegranate, White. Paper: Floral Chics by Fancy Papers. Ink: Black, Watercolor pencils, Markers. Embellishments: Mini rhinestones, Red Grosgrain Ribbon. Acessories: Fiskar scissors, dimensionals. mini glue dots. Labels: Blog Challenge, Sarah Kay images. My Favorite Thing September Challenges. Hello everyone!!! I am so happy to post this early today, well at least for me, LOL. This time I tried all of 3 My Favorite Thing challenges for this month. I would say that I had a lot of fun creating these cards, they are a little different that I usually do, but I love them!!! I hope you too. All 3 challenges are: One to choose the next Guest Designer and the other 2 are Ambassador Challenges. My Favorite Thing Guest Designer Challenge: It was to create a card with something sassy, sarcastic or ironic, well, I tried and tried and I came up with this. Card stock: Confetti White, Certainly Celery, Regal Rose, Burgundy, White GP. Stamps: Inkadinkado, Balloons from PaperTrey Ink. Embellishments: Grosgrain Red Ribbon, SU Double stitched, Clear Rhinestones. Accessories: Sewing machine, thread, Dimensionals, mini glue dots, Diamond Glaze. 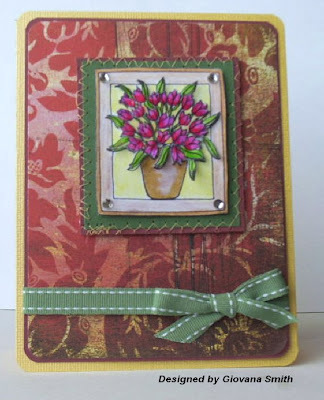 Ambassador Challenge #1: It was to create a card using sentiments in a new or unique way or having them as a main focus. 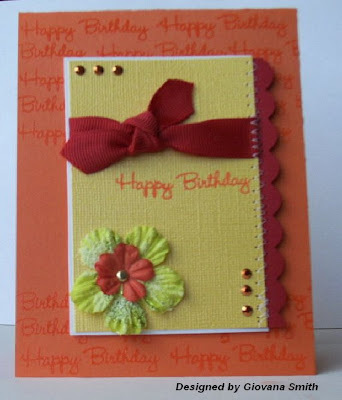 Card stock: Only Orange, White, Bazzil Yellow, Real Red. Ink: Color Box Orange, Clear Embossing powder. Embellishments: Prima flowers, Grosgrain Red Ribbon, Mini Clear Rhinestones, Gold brad. Accessories: Embossing Gun, Sewing machine, White thread, Dimensionals. Ambassador Challenge #2: It was to create a card with NO WHITE paper showing around the main image. Hello everyone, I usually write my post early in the morning, but today is another story, right now is 9:37 pm and I am writing my today's post. Sorry if you came back today and didn't find anything new. Dear husband has some days off and he is using the computer a lot during the day, so I have to wait until he is not using it or do this (post late). I have 2 cards to show this time. Just Saying HI!! I tried Heather Scott's Sketch at Oz-some stamps. She is really talented and she has a new sketch every Monday, I am always late on my challenges, LOL. My card is very simple, most of the times I like to add a lot of embellishments, but this time I decided to go "Clean and Simple. 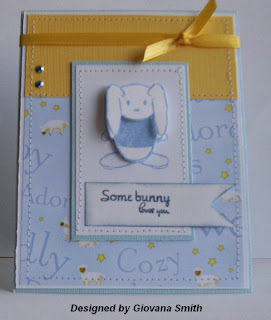 The sentiment is from SU Rub-Ons and the swirls under the birds are also Rub-Ons from Bo Bunny. I stamped the bird 3 times and added dimensionals. Card stock: Bazzill White, Bazzill Yellow, SU Text. Going Gray, Certainly Celery. 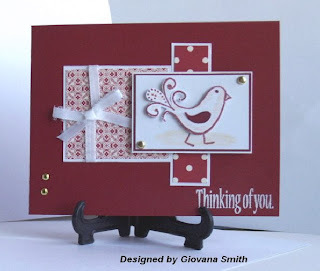 Stamp: Bird from Clear Stamps by Rhonna Farrer. 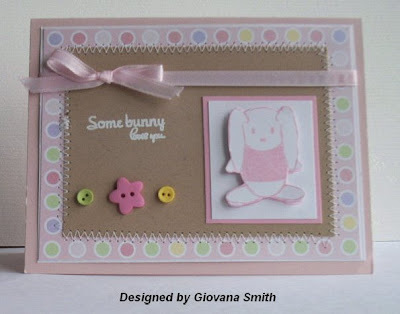 Embellishments: Mini rhinestones, White ribbon, SU Rub-Ons A Perfect Day, BO Bunny Rub_Ons. Accessories: Dimensionals, Diamond glaze, scissors. ... HOOT together!!! 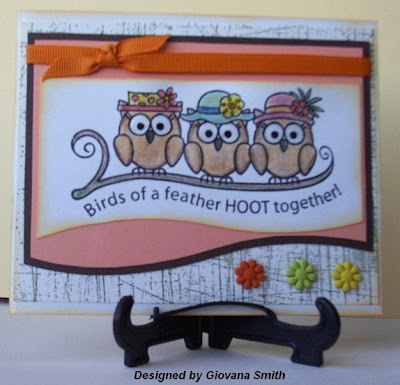 I made this card just for fun, I think these owls are so cute and funny look. 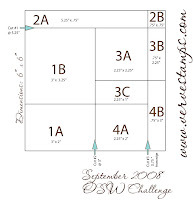 I downloaded the PDF pattern from Kristina Werner's blog. 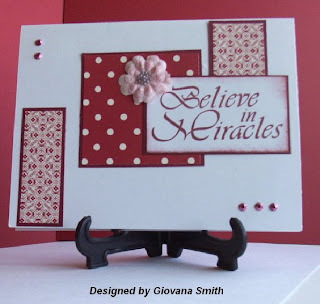 She always has some great and easy designs, love her blog!! After coloring the owls, I applied some Diamond Glaze, hard to see on the pic, but it shines really good!!! Card stock: White, Groovy Guava, Chocolate Chip. Ink: Black, Old Olive, Yellow for sponging, Watercolored pencils. Accessories: Scissors, Diamond glaze, mini glue dots. Please come back tomorrow (or maybe later) and I will show three super cute cards I just finished, but I haven't photograph yet.